Save Big When you Buy 3, the fourth is FREE! Sweet Body Balm is two products in one providing moisture and aromatherapy. Smells great and provides rich deep moisture. Our customers swear by it and it hardly takes up any room in the handbag. Earn 36 Points when you purchase this item! Sweet Body Balm is two products in one. It provides moisture to exposed areas all year long, while providing a burst of essential oil based aromatherapy. Smells great and provides rich deep moisture. Our customers swear by it and it’s so compact it hardly takes up any room in the handbag, and now, when you buy 3 the 4th is our gift to you! Take our Sweet Body Balm with you on-the-go! This body balm stick for hands & body was born from the lotion bars seen at Farmer’s Markets. We formulated the perfect recipe and placed it in a retractable and portable package. Nice and neat. It goes where you go! Perfect for travel, backpacks, gym bags, and purses. 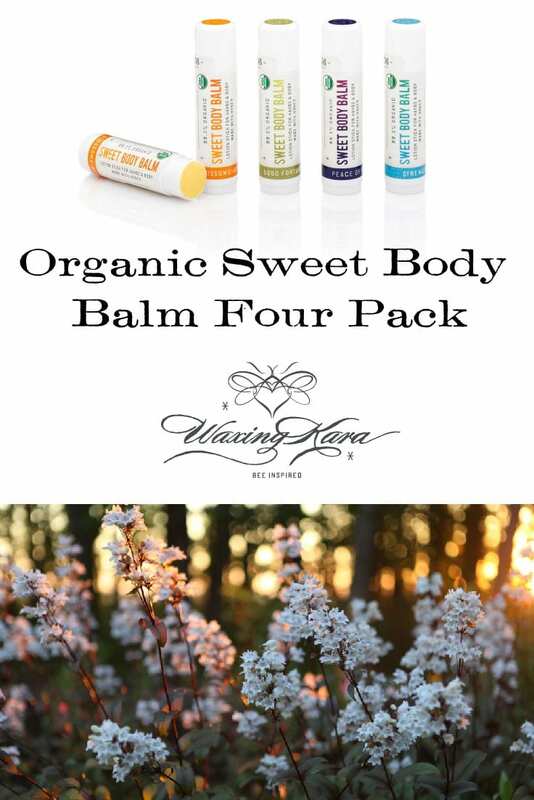 Sweet Body Balm comes with one each of four fragrances: Peace of Mind (lavender/citrus), Strength (cinnamon/clove), Blossoms+Bourbon (orange/geranium) and From the Spa (lavender/rose). Sweet Body Balms make great honey gifts for anyone on your list. Buy three and the fourth one is our gift to you and beautifully packaged in a clear box. Organic Coconut Oil, Organic Beeswax, Organic Shea Butter, Organic Cocoa Butter, Essential Oil Blend, Vitamin E, Organic Calendula, Honey.